As the byelection for the Ajnala constituency of Punjab Assembly has been announced, Left parties have become active to chalk out their strategy in this connection. In protest against price hike, move to privatise the Punjab State Electricity Board and the prevalence of corruption in the state, the Shiromani Akali Dal (SAD), led by Mr Parkash Singh Badal, held a dharna in front of the district administrative complex here today. The Punjab Regimental Officers Association (PROA) is seeking land in Punjab to set up a welfare centre for soldiers who had served with the regiment or their widows. It took 55 years for Rashid Masih, a poor fruit vendor in Lahore, to cross the Red Cliffe line to meet his sister, who lives barely a few kilometres from the international border in this non-descriptive village. The class XII annual examinations to be conducted by the Punjab School Education Board here would begin on March 2. Releasing the datesheet for the examinations the board authorities today listed the schedule of the written and practical examinations of humanities, science and commerce groups that would end by April 4. His commanding eyes and footsure gait compliment the traces of authority in his voice as Punjab’s Director-General of Police (DGP) A.A. Siddiqui asserts: “I am retiring from service, not from life”. In a breath loaded with the same authority, he asserts: “After leaving the job, I will pursue a career in social work. As many as 59 police officials were found guilty of violating human rights in 28 cases last year. A total of 44 complaints against cops were received. Supporters of the Congress and the Shiromani Akali Dal clashed during voting for panchayat bypoll at Salhina village, near here, yesterday. One of the groups reportedly indulged in firing too. Successor will be announced after performing “Challiah”, 40-day prayers at Golden Temple here to take over the reigns of Bhai Harbhajan Singh Yogi’s US-based Sikh Dharma International. Employees of the Ranjit Sagar Dam today blocked traffic on the Shahpur Kandi barrier to protest against withdrawal of their allowances by the Finance Department. An illegal gaushala has come up at a prime land of Market Committee, Barnala. This land is a part of grain market and is worth Rs 1 crore. The gaushala is situated just in front of the office of Market Committee. A view of the gaushala which has come up on prime land of the Market Committee, Barnala. 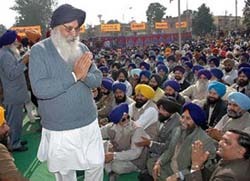 After Haryana, where as many as seven SGPC members had declared to support the Congress candidates, the decision of three SGPC members of district Amritsar to launch campaign for the Congress candidate for the forthcoming Ajnala byelection from tomorrow has caused flutter in the Sikh circles. Members of the Punjab State Electricity Board Engineers Association here today blamed the “misplaced priorities” of the state government for the precarious power situation in the state. Accusing the state of short-sightedness, the general secretary of the association claimed that a profit of Rs 175 crore, as generated by the Board in 2003-2004, was turned into a loss of over Rs 1200 crore during the current fiscal year due to “bad” policy decisions. A delegation of Panj Piaras sent by Jathedar, Takht Damdama Sahib, Balwant Singh Nandgarh yesterday visited the site in the town where followers of the Divya Jyoti Jagriti Sansthan headed by Ashutosh tried to construct a prayer hall on Saturday. Fifty odd beggars have returned near the historic Kali Devi temple premises here two days after the district administration herded and offloaded them outside the city. As hundreds of devotees made a beeline for the temple today owing to Ashtami, many reported manhandling at the hands of beggars. Raj Kaur (98), widow of Nanak Singh, Punjabi novelist and freedom fighter who died in 1971, died after prolonged illness here today. She was perhaps the oldest woman of the state. Rich tributes were paid to 66 Namdhari martyrs of the freedom movement who were blown with cannons at Malerkotla by the British in 1872 at a state-level shardhanjali samaroh organised at Bhaini Sahib here today. The 88 km-long stretch of the Fazilka-Ferozepore road is full of large potholes for the last more than three years. Legislators from Ferozepore district have been promising voters that the road stretch would be reconstructed. Ironically six of eight Congress MLAs belong to the ruling party. Former Cabinet Secretary S.S Grewal died of a brain hemorrhage in New York this morning. He was 80. He is survived by two sons, both settled in the US. 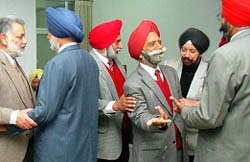 Mr Grewal belonged to the first batch of the Indian Administrative Service after the independence of the country after leaving the Indian Army, where he served for several years participating in the World War II. Mrs Joginder Kaur, mother of Mr Jaswant Singh Mann, Founder-Director of Bank of Punjab and an eminent educationist, died here last night after a brief illness. She was 93. The issue pertaining to the auction of a police of land of a farmer, belonging to Chathhewala village of this district, on the direction of a court has been solved by the district civil and police authorities with the help of a Congress leader last night. Thousands of activists of five farmers’ organisations staged a dharna and organised a rally in front of the Deputy Commissioner’s office here today to lodge their protest in connection with the non-acceptance of their pending demands by the authorities concerned. The Municipal Corporation authorities today demolished extensions created by shopkeepers outside their shops near Lahori Gate. The district administration today launched a campaign to remove encroachments from the government lands in all urban and rural areas. The teams of municipal officials led by SDMs, Tehsildars and Executive Officers accompanied by police personnel removed encroachments in Sirhind, Mandi Gobindgarh, Amloh, Bassi Pathana and Khamano. The police has busted a gang of vehicle snatchers by arresting its kingpin and seizing eight vehicles from him. A trickster fled with a tractor from the Ramlila ground here in broad daylight yesterday. The trickster even came across the tractor owner on his way, but he also managed to befool him. No arrest has been made in the sensational suicide case in which four members of a family committed suicide at Rajdhana village in Rayya falling under Majitha police district due to alleged blackmailing by an RMP of the area. Three policemen of the General Railway Police (GRP), deployed at the local railway station, were sent to the police lines after a large number of residents jammed the traffic on the Bathinda-Delhi rail section for about four hours to lodge protest against their alleged misbehaviour with two women passengers late last night. The SP (D), Mr Baljit Singh Butar, has started probe into the Rabul Bhangu murder case. Rabul, son of Barjindra College lecturer Preetam Singh Bhangu, was killed on the New Year Eve. Education Minister Harnam Dass Johar today urged students to opt for technical courses so that they could not only explore avenues in self-employment, but also take the country further in the sphere of information technology. The Central Board of Secondary Education (CBSE) has given nod to Baba Farid School to start faculties like arts, commerce, medical and non-medical, simultaneously. With this it has become one of a few schools in the entire Malwa belt to have so many streams under one roof. The Punjab Students Union (Shaheed Randhawa) today took out a rally at the local Industrial Training Institute (ITI) to protest against the private bus operators' scheme of issuing monthly passes worth Rs 150 to students. The District Red Cross Society would provide sweaters, shoes, books and school uniforms to all needy students. The state government has planned to collect Rs 4,000 crore through small savings during the current financial year. With a view to increasing power generation at a grand scale, the Punjab State Electricity Board (PSEB) will soon float tenders for a 2000 MW gas-based power plant at Doraha.